After a hard day’s work or a nice bike tour or hike, checking in at Hotel Emmental is certainly a good choice and one that will bring you a good night’s sleep in our comfortable rooms. 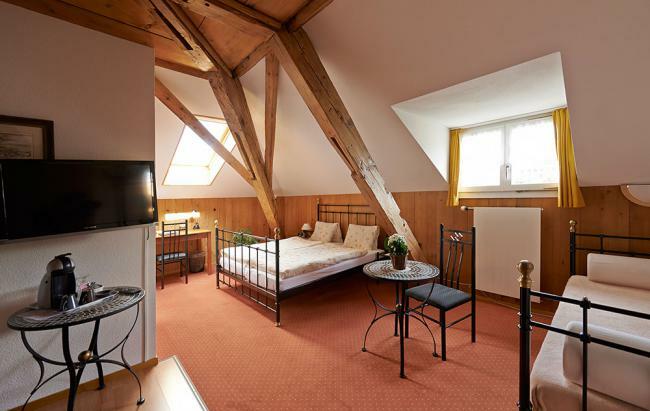 Located in the center of Langnau, the hotel offers you the opportunity for a little stroll to explore the surroundings. Or to let the day pass into evening with a refreshing drink in our beer garden. Our restaurant in the Gasthof zum Goldenen Löwen ist only minutes away on foot and offers you and excellent kitchen with 14 points Gault Millau. After an enjoyable dinner you will spend a quiet night in our newly renovated, individually appointed rooms. Each room offers a private bath, TV and free WiFi as well as a small coffee machine. By the way: Your four-legged friend is welcome in all our rooms! 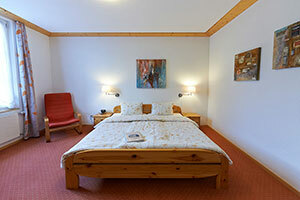 Comfortable single room with French bed, flat screen TV, small coffee machine and free WiFi. Bathroom with shower, WC and hairdryer. Comfortable double room on the 1st floor with a desk, flat screen TV, telephone and small coffee machine as well as free WiFi. Bathroom with bathtub, WC and hair dryer. Modern and very comfortable with a sitting area, a table and chairs, large flat screen TV, small coffee machine and telephone. Free Wifi. Bathroom with bathtub, WC and hair dryer.